The ideal bodybuilding food is high in protein and low in fat...but where can you find this perfect combination? Here we look at some foods that deliver exactly what you need to stay lean while building serious muscle. Bodybuilders know that protein is the key to building muscle. Protein, or the amino acids in protein, help the body construct, repair and preserve muscle tissue. But, in order to get the most effective results from your time in the gym, you must eat quality protein. Let's take a look at the best high-protein, low-fat foods for bodybuilders. Foods that are high in protein and low in fat are perfect. Beef is packed with vitamins, minerals and protein. One serving of beef provides the body with Vitamin B12, B6, B3, zinc, omega-3 fats, phosphorus, selenium, and iron. These vitamins and minerals alone contribute to heart health, better nervous system function, and metabolic health. But the additional benefits of beef are just the icing on the cake. A single serving of beef provides you with up to 25 grams of protein. For a person who isn't into bodybuilding, this translates to 50 percent of the recommended daily allowance of protein. But, as a bodybuilder, you need around 1 gram of protein per pound of body weight so you'll need a lot more protein. The best sources of lean beef are grass fed or organic beef. These forms of beef don't have the added hormones, antibiotics or large amounts of saturated fats. Grass fed or organic beef has omega-6 to omega-3 fats in the recommended ratio of 3:1. The best cuts of low-fat beef for bodybuilders are beef round, sirloin and flank. These cuts have 8, 13 and 10 grams of fat per 3 ounce serving and 25, 23, and 22 grams of protein per 3 ounce serving. There are definitely other forms of beef and if you're in a bulking phase you can indulge, but if you want lots of protein and low-fat stick to these cuts of beef. Chicken and turkey mimic beef's nutritional profile containing all the B vitamins found in beef, but poultry naturally contains less fat and more protein per serving. The best part of chicken and turkey for bodybuilders is found in the breast portion. There are roughly 22 grams of protein in a 4-ounce serving of turkey and a measly two grams of fat per serving. Each four-ounce serving also contains only 120 calories. The nutritional profile of a serving of chicken breast is even more intriguing because it contains 24 grams of protein, 1.4 grams of fat and 120 calories. The nutritional profile of turkey and chicken make them the perfect food for anyone who needs to consume a diet with lots of protein without all the added fat. When it comes to low-fat and high-protein, fish beats out all other forms of whole foods. 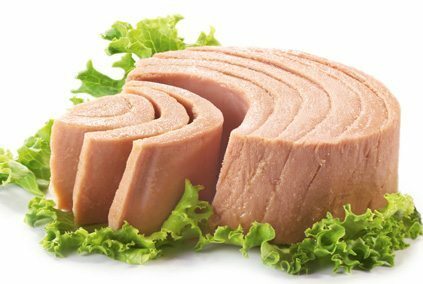 One serving of tuna, for example, contains vitamins B1, B2, B3, B6, B12, D, magnesium, potassium and omega-3s. These vitamins, minerals, and fatty acids provide antioxidant protection, cardiovascular benefits and help protect bones. The best part is the ratio of protein to fat contained in fish. One 6.5 ounce can of tuna contains 42 grams of protein, 1.37 grams of fat and only 194 calories. Of course, there are other forms of fish to choose from that offer similar amounts of protein with low amounts of fat. Salmon, tilapia, oysters and shrimp all contain a great deal of protein without a lot of fat or calories. Whey protein deserves a mention as a form of protein that is fantastic for bodybuilders. Although it is technically not a whole food, most forms of powdered whey protein are high in protein and extremely low in fat. One serving of whey powdered protein gives around 20 grams of protein and no fat. There are many varieties that offer slightly more protein per serving, so you can just shop around and find the one that is right for you. Whey is the perfect food after a workout when you need to consume a quick digesting protein to help you start the recovery process. In bodybuilding, protein is king. Foods that contain high amounts of protein and small amounts of fat are going to make a big difference in both helping you build and maintain muscle and keeping fat gain to a minimum. Specific cuts of beef will give you adequate amounts of protein with some fat, but not enough to make you gain weight when eaten in moderation. However, poultry, fish and whey protein are the foods that will give you the freedom to eat a lot with very little concern for fat gain. These foods are healthy for you, will help you recover faster and will contribute to helping you gain lots of muscle.